This is a guest post provided by Kaylie Kipe from the Tag Inspector team. So you’ve recently learned about Tag Management Systems (TMS) and you’re considering the big migration. After all, TMS implementations can be pretty magical, especially if you change tags frequently or requested changes take days (or weeks or months – oh my!) to be implemented. Now all that’s necessary is determining the TMS that’s a fit for your organization, right? Well, yes and no. We actually first suggest a thorough understanding of the pros and cons that may come with implementing a tag management system in your particular organization. We realize this might sound a bit silly, as this is the blog of analytics and tag management suite, but it’s rarely a good idea to jump first and ask questions later. Realizing you may be just getting started on your tag management system journey, we’ve laid out the benefits and pitfalls below. By the end of this article, you’ll have a better idea of what you can gain, and what to be cautious of, when implementing a TMS. A tag management system can save time in multiple departments. More specifically, development and marketing. With a TMS, technically-skilled marketers can add, remove or change tags with nary a muscle moved on the part of the development team. This leaves developers free to work on strategic projects, versus repetitive – and sometimes monotonous – tag deployments. Meanwhile, marketing teams remain agile and can launch new platforms or campaigns quickly and efficiently. Working with dozens of marketing platforms or organizations, each with their own tracking tags and requirements, can wreak havoc on your DOM. Which tags load where? When does each tag load? What data does each tag need and is it getting said data? The organization of a tag management system can help bring order to the madness. By their very nature, tag management systems classify tags by how they send data, when they send data and the triggers that, well, trigger them to send data. Have you ever asked (or been asked) where a tag was from or what it accomplished, only to be met with (or provide to others) a blank stare? Lengthy or difficult processes for changes can lead to outdated tags collecting data long-past their intended shelf life. A tag management system can help an organization remove tags from vendors they no longer work with and update tags, for security or other reasons, in a timely fashion. Everyone makes mistakes from time-to-time. You just really don’t want one of those times to be on an enterprise-level website where you stopped collecting data or caused important information to be counted multiple times per user. While a tag management system makes it easier than ever for non-developers to implement changes, it still does require attention to detail and testing pre-launch. Ensuring that those using the tag management system are properly trained is an important aspect of successful implementation and failing to do so can have negative consequences indeed. Remember when we said that a tag management system is great for improving the security of your website, due to the swiftness with which unused or outdated tags can be taken care of? Of course you do, it was mere paragraphs ago! Well, it turns out that security is also a potential pitfall of a TMS. The security concern here comes down to TMS access. With the power to quickly and easily start or stop data collection, there also comes responsibility. Those that have access to modifying tags should have a reason to be doing so and the organization should track who has been given access, auditing regularly. We feel that any potential pitfalls can be mitigated, allowing for a successful implementation and a “happily ever after” with your chosen tag management system. That said, each organization must make this decision for themselves based on the pain points associated with their current system and the technical capabilities of those on their team. Kaylie Kipe is a digital marketing manager at Tag Inspector. Tag Inspector allows you to search your entire site for any tag in real time. Their tools assist organizations with troubleshooting, monitoring and data compliance regulations. Trying to find the best Tag Management System for your organization? Don’t worry. We’ve done the research for you. 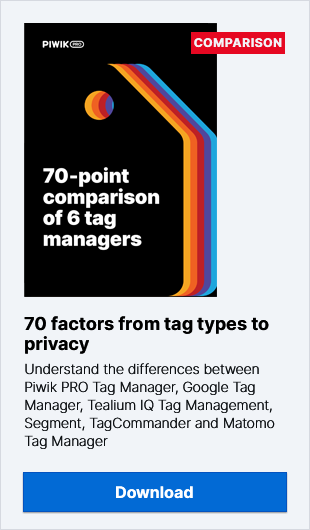 Download the most comprehensive analysis of Google Tag Manager, Piwik PRO Tag Manager, Tealium, Adobe Dynamic Tag Management and Ensighten. We discuss over 40 functionalities of 5 most popular tag manager vendors to make your decision easier. And it is completely free!